Bernhard Gissibl is author of The Nature of German Imperialism. Conservation and the Politics of Wildlife in colonial East Africa, published this July by Berghahn. His work analyses the role of hunting and game conservation in the making of the col0nial state in what was then German East Africa. 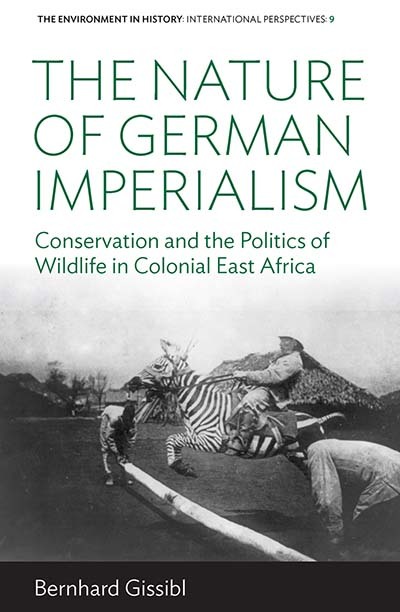 The book reveals the years of German colonial rule prior to World War I as the foundational period of Tanzania’s extensive wildlife conservation regime. Here he discusses his work, some of the surprises and challenges that the topic entailed, and what he found most rewarding about following the archival tracks left by the elephants and lions of the past. What drew you to the study of wildlife policies in the period of German rule in East Africa? It would be too easy to blame it all on the elephants and the allure of the species also for historians. Obviously, there are several factors involved in the choice of such a topic, but I vividly recall one lunchtime conversation with fellow academics at Munich University in the early 2000s. We touched upon the wildlife films and TV series of the Frankfurt zoo director and celebrity conservationist Bernhard Grzimek. His series had been a regular feature on German television in the early 1980s and watching the films was a shared childhood experience for those born in the 1970s. Yet, we were all at a loss to explain where Grzimek came from in historical terms. What were the political and cultural trajectories of his depiction of Africa? Where did his engagement for charismatic megafauna come from? After all, he had started to put the East African savanna on Western screens in the middle of the 1950s, and he produced his films and intervened in the wildlife debates of a region that had been a German colony just a few decades earlier. So I started investigating the prehistory of Grzimek, and how Germans engaged with Africa’s wildlife when they came to the continent as colonizers in the wake of the notorious Scramble for Africa. First and fortunately, I discovered that virtually no research had been done on the role of wildlife in German colonialism. Ploughing into the archives, I discovered that one of Germany’s biggest environmental scandals of the Kaiserreich was triggered by controversial wildlife policies in East Africa. And I found that Grzimek’s activism had a turn-of-the-century precursor in the person of Carl Georg Schillings, an amateur naturalist and hunter turned conservationist who had undertaken four expeditions to East Africa in the late 1890s and early 1900s. Like many of his wealthy European contemporaries, Schillings hunted for trophies and natural history museums. What made his expeditions distinctive, however, was that he took flashlight pictures of African wildlife at night. Upon return to Germany, he used these pictures in lavishly illustrated books as well as in lantern slide shows that were extremely popular across central Europe in the late 1900s. His lectures and publications rang the alarm bell of East Africa’s charismatic wildlife in rapid decline, thereby anticipating many of Grzimek’s concerns and arguments half a century later. This sounds like Carl Georg Schillings is a key figure in the book? Schillings was certainly important for establishing African wildlife conservation as a social concern in Germany. But this is only one aspect of the book’s broader effort to integrate the analytical levels of colony and metropole, respectively the transimperial and international. Schillings’ concern is situated in the broader political ecologies of East African wildlife that emerged under the regime of the caravan trade during the 19th century. Access to elephants and ivory had become a vital resource of political power in precolonial East Africa, and the book shows how this culture and the politics of elephant hunting has shaped the making of German colonial rule in the later territory of Tanganyika. Tusks were the currency of German conquest, and the control of elephant hunting and ivory stood at the beginning of Tanzania’s modern wildlife conservation complex. What are further important findings of your research? Apart from tracing the piecemeal, staggering and conflicting development of wildlife policies in German East Africa, my study also argues that these efforts are best understood as entwined co-evolution with the British efforts in neighboring Kenya. The Germans had a constant eye on what happened north of an ecologically irrelevant border, and they watched with envy how the British managed to combine game conservation with a blossoming industry of safari hunting. The concern of hunting-minded governors in both colonies over the rapid depletion of elephants initiated the internationalization of wildlife conservation across sub-Saharan Africa since 1900, and there were even efforts at establishing a transboundary game reserve prior to the First World War. From the outset, wildlife conservation in East Africa had an eminently transimperial dimension. Finally, some of the material I consulted suggests that the colonial encounter with East Africa’s fauna was a source of German environmental sensibilities in its own right. It did not only mark the beginning of a long-standing German engagement in East African conservation. It also exposed a glaring void in German environmental identities, i.e. that nature in 20th century central Europe featured no such thing as wilderness. This triggered a desire among German conservationists for ‘original’ Nature that was projected, amongst others, onto the fauna and the forests of Eastern Europe as well as upon the nature of an allegedly Germanic past. In the case of the so-called ‘German East’, projection was followed by violent reclamation in two World Wars. The title you have chosen – The Nature of German Imperialism – is suggestively broad. Can you explain? John MacKenzie has employed a similar play of words in his magisterial Empire of Nature in 1988. Therefore, I do not claim too much originality for my variation. Still, the message cannot be emphasized enough. By analyzing the imperial treatment of nature – nature as a locus of power, with a small as well as with a capital ‘N’ – one can learn an awful lot about the nature of Empire and the workings of the colonial state. Nature has not been merely the stage or a passive backdrop to the spectacle of colonialism, but an agent and essential part of it. In fact, the title goes further than merely claiming that Empire pertained to the soil and its flora and fauna. The choice of “imperialism” over “Empire” or “colonialism” was deliberate. In the German case, the fact of “being an Empire” has always been less significant than the will to act like an Empire. The often racialized imaginaries of pristine land and wilderness erase the human factor from African landscapes and have a powerful presence to this day. So have asymmetrical constellations of power and participation, ideas of Western stewardship of wildlife and natural resources, a gatekeeping state interested above all in capitalizing on wildlife as a resource. All these phenomena are not restricted to colonialism and its historical projects and territories. They have an imperial dimension and an unbecoming presence in conservation to this day. Yes, quite a few. Perhaps the most important change in perception concerned the nature of conservation. Like many others, I started out with the Eurocentric perception that conservation is something inherently ‘good’ and progressive. The European discourse of nature conservation has always portrayed preservation in inviolable national parks as the ultimate target – pockets of wild nature wrested from the rapacious logic of a capitalist industry and agriculture. I started my research with this teleology in mind. There is no denying that colonial conservation, too, was marked by a widespread rhetoric to preserve, for a white, imperial posterity, a nature that was threatened by the advance of ‘civilization’ and ‘development’. Such aspirations were as idealist and progressive as they were racist, and they definitely helped legitimize conservationist policies. Yet, in the course of my research, I found conservation’s compatibility with the economic and administrative logic of colonial rule the more striking feature. East Africa’s charismatic species may have been framed as natural monument and an imperial heritage, but, above all, they mattered for a cash-strapped colonial state as a resource and a source of revenue, first in the context of the ivory trade, later with a view to hunting tourism. Conservationist measures could be implemented and game reserves were established because conservation and sustainable hunting were politically and economically expedient. Conservation became woven into colonial structures of oppression, with the consequence that, unlike in Europe, the larger fauna was not colonized away by development, but became a vital part of it. The majority of sources analyzed for this study was lifted from the colonial archive. Material in these archives is marked by enormous gaps, it is full of racist terminology, and the documents contain all the knowledge and, even more, the non-knowledge on which colonial power was founded and on which colonial power often foundered, too. Reading such documents “against the grain” and mining them for traces of African as well as animal agency was perhaps the greatest challenge. Past wildlife policies are situated at the intersection of a vast array of disciplines and specializations – imperial and environmental history, anthropology, African studies, human-animal studies, and political ecology, not to mention all the knowledge accumulated during a century of research in the various wildlife-related sciences. This made the study of this topic daunting, intellectually stimulating and extremely fascinating. My occasional and insufficient forays into other research fields would have been impossible without the support and counseling of academic friends and colleagues. Colonial historians often deploy the analytical term of a contact zone to their material, but their research topics constitute cosmopolitan contact zones, too. My research in archives between Berlin and Dar-es-Salaam and on conferences across continents has been such a contact zone, and the encounters with a great number of helpful, kind, and enriching people was definitely the most rewarding aspect of writing this book. Read the Introduction online for free. Bernhard Gissibl is a permanent Research Associate at the Leibniz-Institute of European History in Mainz, Germany.